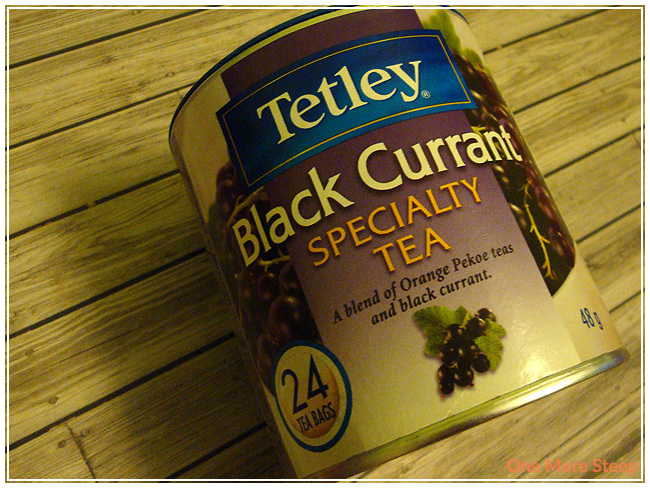 Black Currant is one of Tetley’s specialty blends – this also makes it hard to find in stores. I got mine from my sister, who had some in her tea cupboard. Tetley’s containers are quite nice, the round plastic lid has a snug fit. Black Currant comes prepackaged into tea bags, much like the rest of Tetley’s products. The smell is unmistakably fruity and a bit floral. It doesn’t smell like it would be an overly sweet tea, but it does smell like black currants so that’s a good sign! The ingredients for Black Currant are: pure black tea and black currant flavour. I typically like my tea bags to come with strings (it just makes for easier retreival), but it’s no problem that the simple use of a spoon can’t fix! 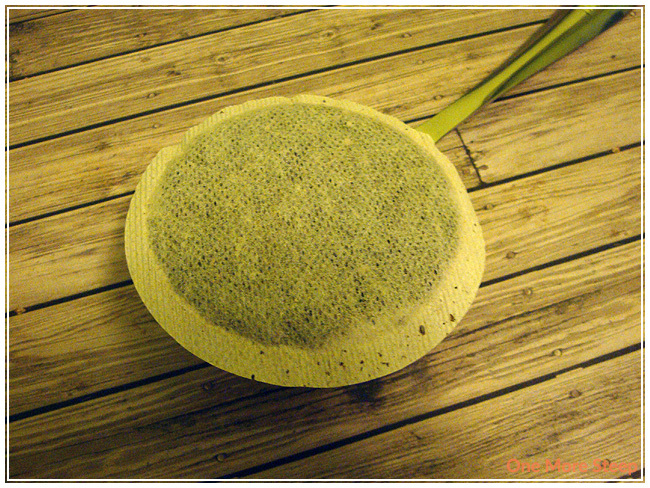 The recommendations by Tetley are to use boiling water and to steep for 2-4 minutes. I opted for around 3 minutes of steeping time. While steeping, Black Currant smells very fruity and very much like black currants. 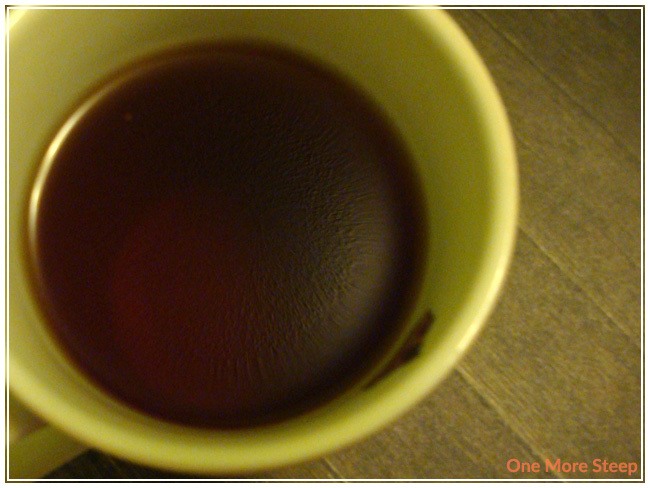 The tea is a lovely dark reddish brown colour, that almost reminds me of apple cider in its colouring. On first taste, I’m a bit disappointed. While the tea smells really good, the flavouring isn’t quite meeting my expectations. The tea itself smells great, but the scent of black currant doesn’t match up with the weak black currant taste. I put the tea bag in to step it for a bit longer (to meet the higher end of the 2-4 minutes of recommended steep time), but that did little to improve the flavour. I did not opt the steep Black Currant for a second time. I didn’t like Tetley’s Black Currant. The amazing scent of the tea that reminds me a lot of black currants fell sort of expectations with the taste. Black Currant was a very weak tasting tea, despite steeping it according to recommended specifications. At best, Black Currant reminds me a lot of flavoured water. I think it might be nice as an iced tea, when you’re looking more for something to parch your thirst, but it doesn’t do well when you want something comforting like a hot cup of tea. I love Tetley’s Black Currant tea mixed with Tetley’s Orange Pekoe at a ratio of 1-1 in a big pot. Yum! That sounds like a good combination! My favourite tea but very hard to find. Safeway stopped selling it. Where can I find it? Hi James! That would be a question best directed towards Tetley in your country 🙂 They’d probably be able to point you to your local retailers that carry their products.